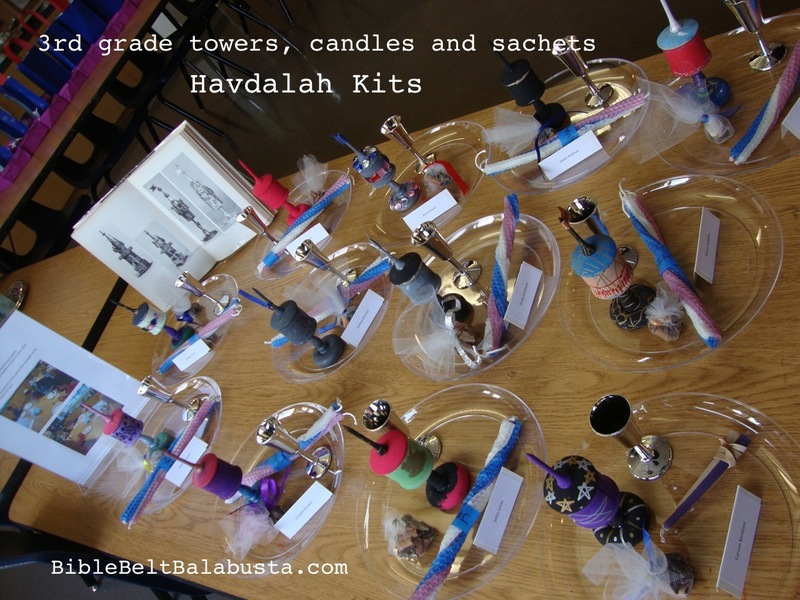 Every year, our synagogue’s 2nd and 3rd graders lead a special Havdalah service, and I’m the lucky teacher who gets to help them make a full Havdalah kit to take home. Of the three components: kiddush cup, besamim and candle, my favorite is besamim. 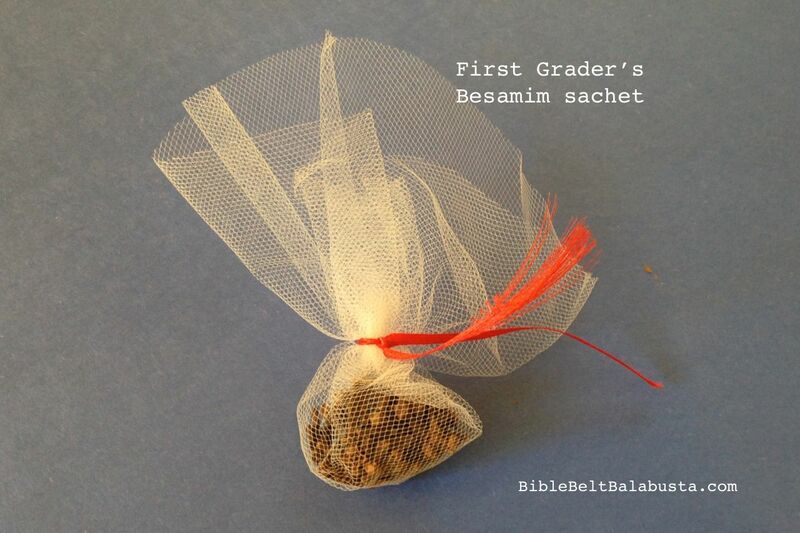 The basic requirements for Havdalah besamim are that they smell good and are natural. The “smell good” part is subjective: what smells marvy to one kid might stink to another. The fragrance is supposed to console us as Shabbat—and our temporary “extra soul” / neshama yeteira—depart. Quick: A pretty herb in a pot can be besamim as is, still in the pot, every week. Perennials like rosemary and lavender are good, or annuals in the mint family: in all cases, rub the leaves to release scent. (One of my older Israeli friends says she grew up using basil for havdalah!) Terracotta pots are best, or any other natural material, and can be decorated to suit. Oil pastels, paint pens, acrylic paints and decoupage look great on terracotta. 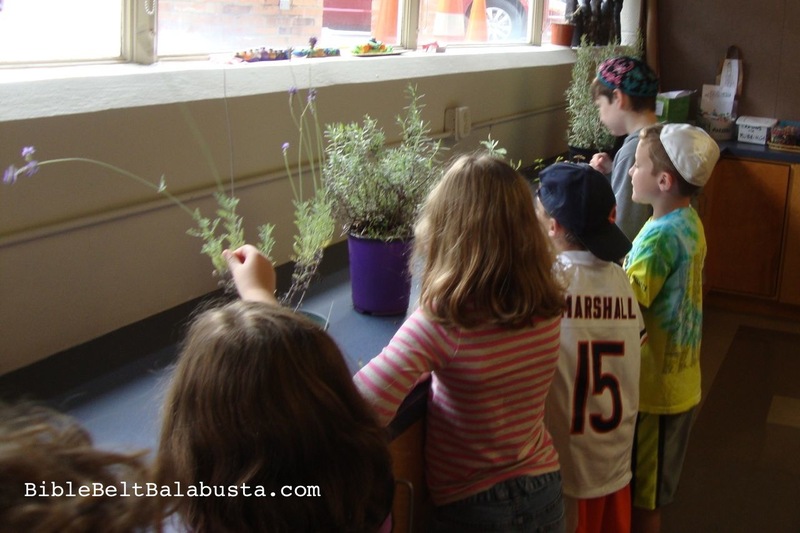 Slow: Grow herbs with kids, indoors or out, starting with seeds or small plants. See my earlier post about Havdalah Container Gardens. •Make a Sachet of “Classic” Besamim: cloves and cinnamon. These two traditional besamim spices are long-lasting, easy to find, easy to store, and blend with one another beautifully. Buy tulle circles in the wedding aisle of a party/craft store. Or, buy tulle by the yard and make big kids cut it into 8 inch squares. Buy whole cloves and cinnamon sticks. They last forever. Kid breaks cinnamon sticks w/ hammer or by stomping on them. Kid places a teaspoon or two of the spices in the middle of the circle. Kid raises edges of tulle with fingers and twists shut. Kid cuts a length of narrow ribbon and ties it over the rubber band. Can you tell he cut his own ribbon? Please try not to use pre-made drawstring bags for sachets. They don’t require any effort from a child. In contrast, a tulle circle makes students think and work and, in many cases, try something new. They create. Prepare a buffet of herbs and spices and let kids explore. They rub, crush, break and sniff, depending on the object. I bring pots of herbs to rub, plus stuff like dried orange peel, dried myrtle branches from Sukkot, a clove-studded etrog from Sukkot, cedar twigs, pine needles, coffee beans, and chocolate. Each student chooses what to put in the center of a tulle circle, and then finishes it with the rubber band and ribbon, as above. Some students still end up with just cinnamon or cloves—the ol’ standbys—which is just fine. The buffet and bag-making take a full, half-hour class period, but we often add a seed-planting component. This year, we planted lemon balm, one of the few herbs that elicited unanimous approval. After Sukkot, save the etrog and lulav (synagogues will gladly save leftovers if you ask in advance). A fresh etrog, as is, can be the besamim. Scratch and sniff: Yummmmm. Before it starts to dry out, preserve it by turning it in a pomander. Stud the whole thing with cloves. My students (First Grade and up) poke holes with a wooden scratching tool /stylus and poke a clove into each. See my post for details. Save the lulav, too: the myrtle branch dries quickly and retains fragrance when crushed (myrtle is in the clove family). You can also use the whole lulav at Passover, to help sweep crumbs for Bedikat Chametz and to start the fire. Kids make this test for peers. In our case, 2nd graders devise it to stump their parents and especially to stump the 3rd graders, all of whom attend the culminating Havdalah service together. This means that the 2nd graders are highly motivated. Tips: film canisters are the perfect size, but the lids, despite the number of holes I poked, just don’t allow enough fragrance to escape. So, we used tulle fabric (leftover from besamim bags) stretched over the top of the canister and secured with a rubber band (leftover from besamim bags). This let people stick their noses right up close and get a whiff of: dried orange peel, shaved chocolate, coffee beans, lavender leaves, rosemary leaves, pine needles, cinnamon sticks, whole cloves, sage leaves, and mint leaves. A Spice bottle is ready-made for repurposing. (Unless it’s garlic. I’ve never been able to remove garlic odor from plastic garlic powder containers.) Spice containers already have a lid with holes (underneath the screw-on lid) so no poking is required. Decorate the outside with decoupage, tissue squares, paper or, if your kids can handle the flames, with a full layer of wax dripped from Hanukkah candles. If the spices are noisy enough, the container can double as Purim gragger. Small cans / tubs with lids: A small baking soda can, for example. Poke holes in the lid, fill the container with fragrant things, decorate the outside. Old film canisters are great, but increasingly rare. Pill bottles are doable, but child-proof lids are too thick to poke easily, so use the flexible, easy lids (pharmacies keep them for people who cannot physically manage the child-proof type). Boxes: Craft stores like Michael’s usually have very small, hinged wooden boxes with a screen inset in the lid (around $1.99 without a coupon). Like, about 2.5″ long. Kids love operating the teensy metal hasps and so do I. These are lovely stained, painted, decoupaged, etc. Even just a watercolor wash can be pretty. 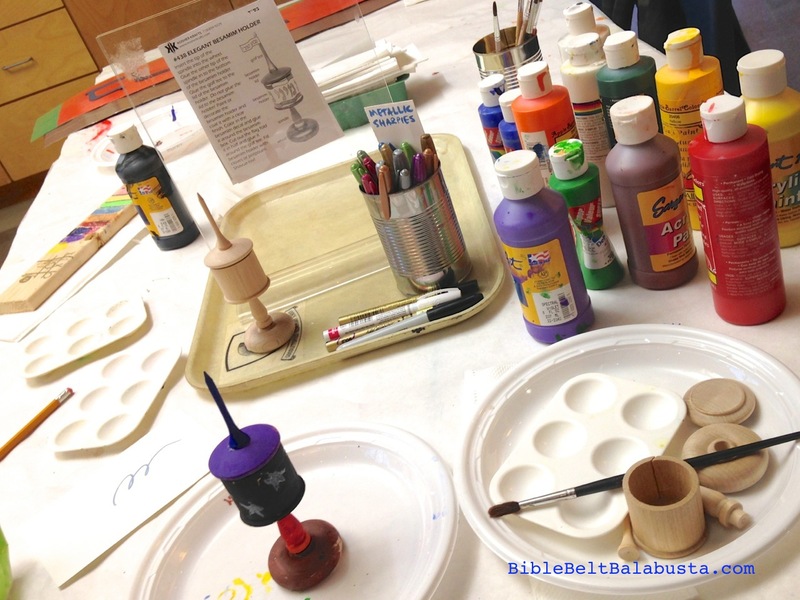 KosherKrafts makes a comparatively inexpensive kit my students love to paint, assemble and decorate. I can’t buy the individual pieces for any cheaper. My photos are of 3rd grade versions (we don’t use the kit’s paper pieces). KosherKrafts also makes a cheaper Junior spice tower kit, a Deluxe kit, and various other spice kits. No, I don’t get a discount. I wish. The DreidelMaker has beautiful spice tower kits, and I notice they sell beeswax for candles. I sure would love to find out if its the “good” wax. Havdalah service (the blessings in Hebrew and English), also from Moises House Rocks. Printable PDF. Wooden spice tower kits are linked in the relevant paragraphs above. Follow this blog (see top middle column of front page). 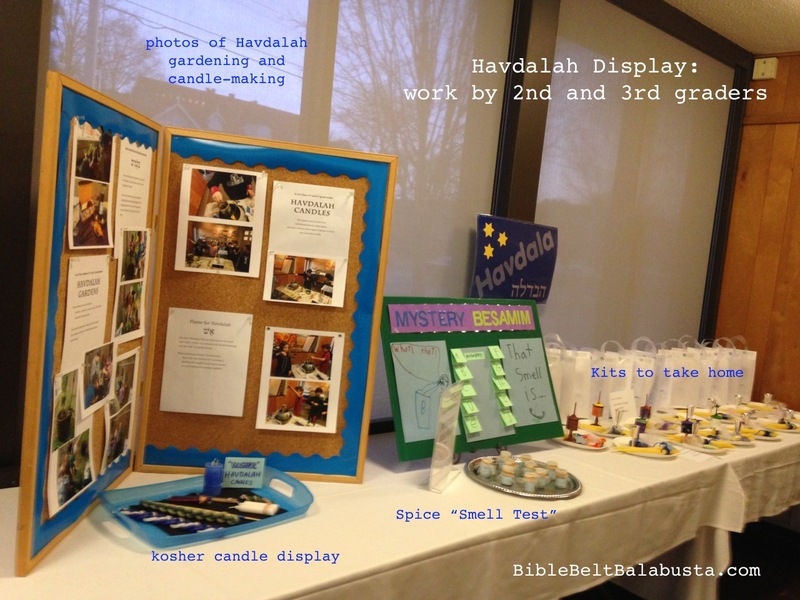 This entry was posted in Activity, Crafts, Havdalah, Shabbat and tagged besamim, gardening, Havdalah, herbs. Bookmark the permalink.